This photo layout and feature article on Burning Books Press and book artist David Drum, above, appeared in Bound & Lettered, an internationally circulated publication focusing on artist’s books, fine bookbinding, and calligraphy. Bound & Lettered is published by John Neal, Bookseller in Greensboro, North Carolina. "Liberties are not given, they are taken by David Drum (Los Angeles, Burning Books Press, 2008, Ed. of 100, pink, black and blue, signed and dated by artist, $9.95) is a very appropriate visual poem about Freedom, as inspired by a quote from Aldous Huxley. The pages scream off the page–and yet are simple, beautifully executed, and powerful. If you love visual poetry, freedom, rights and privileges, and liberty, then this is the book to buy, give and return to it often." “Liberties are not given, they are taken” is literally the finest thing I’ve ever received through the mists of mail art. Thanks so much. “I’ve been collecting the artist's books of David Drum for 15 years, and have always taken pleasure from their beauty, imaginativeness, aesthetic range and an amiable ambiguity which pulls me away from daily life to a soothing aesthetic contemplation. I first encountered David Drum’s poems in Alice Notley’s magazine Chicago, where they extravagantly stood out from the other contents. I liked them a lot. Michael Lally has recently published a small collection, FAÇADE, more or less making Drum available to all comers. 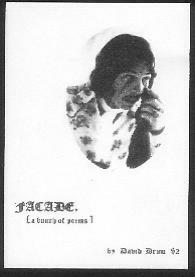 FAÇADE (A BUNCH OF POEMS) consists of 9 poems over 38 pages. Though Drum works in narrative with subjects that don’t lend themselves to haiku, he’s admirably concise. I will go with dandelions. If you work in scope & narrative you can step out for an aside, which will show your skill & heart clear & true. SOUTH is Gone With The Wind, as it were, completely different & as cynical & sentimental as the original in the space of 8 pages. (Vide on concision.) I don’t mean that it has the same plot, but that it is the same story. PORTRAIT V is not an epic, but a fairy (decadent, folk) tale, about Cinderella, gathering the faggots in the evening before the 3 wicked stepbrothers take their turns sharing the nookie, & her brief liaison with the Village Idiot. THE ALCHEMIST is also a fairy tale & reminds me of some of the old cartoons I watched as a kid, as do a lot of Andre Breton’s poems. The last poem, THE OLD CASTLE, OUI, is a personal address, the only one of its kind in the whole book, but still a “story.” The recipient of the poem ends up in a German castle and so we pass from literature into romance, in the literary (not pejorative) sense of the word. Drum’s poems are different in scale & purpose from most other poems produced today; he seems to be working at bringing “epic” & “narrative” back into common or current usage. Scale determines his repertoire of effects & images and forces some of his sentimentality upon him. The more one puts in (in a small space) the simpler one’s diction & images need to be. Drum’s colors are primary. The most common is white, not a color. His poems are generally melancholic in tone & have a prosy wit that mitigates the sentimental. Maybe only a comic epic is possible these days. His poems are quite funny & reminiscent of the lighter works of such noted academics as Howard Nemerov (whose LOT LATER comes to mind) or Reed Whitemore. This isn’t a putdown (I like to read that kind of poem) but rather a reminder of who has been working this field most recently, before persons such as Drum began chopping cane. The best is, of course, Kenneth Koch, long may he wave. Along with Koch in The Art of Love and Richard Snow in The Funny Place, Drum is reacquiring territory from the academics & the past & shows signs of producing an interesting and original body of work which may well prove to be as necessary an oeuvre as that of any young poet today. I recommend him to your judgment, which will be just.